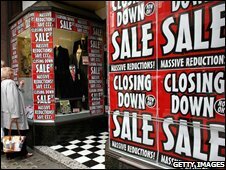 BBC NEWS | Business | Q&A: What is a recession? Q&A: What is a recession? The dreaded R-word - recession - is in the air as every day seems to bring more gloomy economic news. Many commentators are now openly talking about the current slowdown turning into a recession. But how do economists define a recession and when will we know if the UK is going through one? What is the definition of a recession? This is a thorny question on which experts still disagree. However, technically speaking, the UK economy would slide into recession when it experiences two successive quarters of what is known as "negative growth". For this to happen, the total amount of goods and services produced by the UK - known as gross domestic product (GDP) - would have to contract on a quarter by quarter basis for a total period of six months. Are there different degrees of recession? The economy could contract in two consecutive quarters but then recover and actually see growth for the year as a whole. Were that to happen, most commentators would label it a mild recession. However, there is also the danger of a full-blown or severe recession where there is an absolute decline in economic growth on a year-by-year basis. There have been five full-blown post-war recessions, in 1974, 1975, 1980, 1981 and 1991. In 1991, the economy contracted in three consecutive quarters and annual GDP fell 1.4% compared with the year before. But there are also recent examples of a mild recession. In 1990, the economy retreated in the final two quarters but its growth in the earlier part of the year was enough to ensure expansion for the year as a whole. Are there less formal indications of a recession? Technical jargon aside, the psychological impact of the tougher economic climate on people cannot be underestimated. In the US, experts such as Alan Greenspan say families now feel as if they are living in a recession - even though it is not technically the case - because living costs have risen so fast in such a short time and incomes are being steadily squeezed. This is likely to make people more cautious, causing them to spend less and, in turn, harming the economy further. A similar "feel-bad factor" may be taking root in the UK and some experts have warned of the dangers of a self-fulfilling prophesy whereby, by making regular comparisons with the mid 1970s and early 1990s, the country talks its way into a recession. When will we know if the UK is in recession? One of the problems about officially declaring a recession is that one can only confirm it after it has happened. Official GDP figures are published about every three months by the Office for National Statistics and sometimes its initial estimates have to be revised later when new information emerges. For instance, were the UK to go into a mild recession in the last six months of 2008, as some experts are now forecasting, this would not be confirmed until early next year. As for the fear of a full-blown recession, we will only really know about whether this has come to pass next year or even 2010. The economy shrank for the first time in 16 years between July and September 2008 confirming that the UK is on the brink of recession. Output fell by 0.5%, according to the Office for National Statistics, a bigger-than-expected drop, and most analysts believe the UK is about to enter recession and have called for aggressive rate cuts to ignite the economy. The UK will be classed as being in recession if the economy slows in the fourth quarter as well. The 0.5% fall is the biggest drop in UK gross domestic product since the first quarter of 1990.